Hundreds of EFF supporters gathered at Dlomo Dam in Sharpeville on Thursday, to pay tribute to the 70 people who were massacred by apartheid cops during a peaceful protest 59 years ago. Julius Malema delivered a rambunctious speech and, well, you know how it goes from here. The party leader was at his vociferous peak on Human Rights Day, going on to explain that he only calls the public holiday "Sharpeville Day" - he told the crowd that the "human rights" part washes over the atrocity itself. 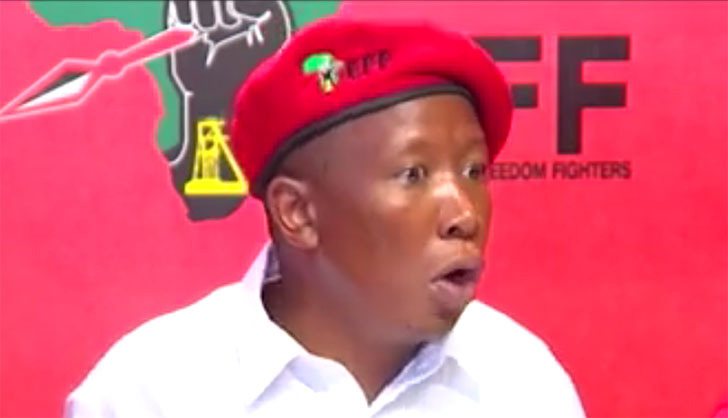 Malema made several eye-catching statements during his address, claiming that white people must never be forgiven for what happened in Sharpeville. He also turned on the electioneering charm, telling supporters that only the red berets could return the land and create jobs for unemployed black citizens. #EFFSharpevilleDay Malema: We know that our parents were exploited, they can't leave us anything. They don't have wealth and property, but we are asking out parents to give us the land. On the 8th of May, our parents have the opportunity to give us the land. Juju is no stranger to causing a stir, but it would be his comments about Zimbabwe that fetched the most scrutiny. South Africa's land redistribution proposals have found themselves (somewhat unfairly) compared to the disastrous policies of Robert Mugabe, who incited black citizens to invade the land of white farmers. The economic disaster that followed has been a huge cause for concern for the South Africans who disagree with non-compensatory land expropriation. However, it would seem Julius Malema is ready to embrace the chaos that came before, claiming he's happy to tell people that Mzansi is already "worse than Zimbabwe". Said Malema, "We are not here to please white people. When you leave here, they are going to say to you, ‘Malema will turn South Africa into Zimbabwe'. Tell them we are worse than Zimbabweans." "Firstly both ourselves and Zimbabweans are poor. Secondly, Zimbabweans own their land and finally, Zimbabweans are literate and we are illiterate." Malema himself has previously shown support for the way Zimbabwe ruthlessly implemented their land policy. His comments at the Sharpeville event will do nothing to calm his detractors, but Juju isn't a man who's out to please his critics. In fact, he's probably at his happiest when he's winding up those particular opponents. #EFFSharpevilleDay Malema: They want you to think because you are working in the house of the white master, you are better off than the slave working in the field. Whether you are a better slave or not, we are all slaves . We must fight to become a Master. We must own land.